A social drama with biting humour, The Squid And The Whale is a clear-eyed look at the devastating consequences of middle-class divorce. It's the 1980s in Brooklyn, and the marriage of Bernard (Jeff Daniels) and Joan (Laura Linney) finally disintegrates. He is a middle-aged and already has-been pompous academic who can no longer find a publisher, while she is an emerging writer. Their 16 year old son Walt (Jesse Eisenberg) idolizes his dad and quickly takes his side, particularly when he learns that Joan has been carrying on a long-term affair. The younger twelve year old Frank (Owen Kline) is simply traumatized and starts to act out in all the wrong directions. Bernard moves out of the family house and rents a derelict place of his own, and the boys are forced to shuttle between parents. Walt finds a girlfriend in sweet Sophie (Halley Feiffer), but his father's advice interferes with their relationship. The sexual tension amps up when Bernard's college student Lili (Anna Paquin) moves in and stirs the pot with both Bernard and Walt. Meanwhile Joan finds herself a new lover, accelerating Frank's anxiety. Written and directed by Noah Baumbach, The Squid And The Whale is an adept 81 minutes of cutting social commentary. The semi-autobiographical script never blinks: this is a small family thrust into a full-blown crisis, four members running in different directions, doing their best to hurt each other, lives broken and altered forever. And as ugly as the debris looks, Baumback also finds the dry humour. Bernard wallows in a legend of his stature that exists only in his mind. He pontificates about literature several leagues above his capabilities, only for Walt to mimic his father with even less credibility. Joan is no better, having long since given up on her husband, wrecking the marriage with her affairs and quickly moving on to the next lover, this one even more damaging to the family, as soon as Bernard moves out. Underneath the daily anguish is a prevailing sense of sadness and waste as two boys are led astray. 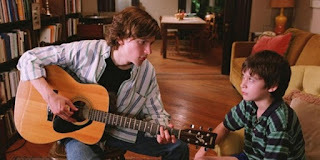 Walt is quick to internalize his father's fake arrogance, with consequences both at his school music competition and with potential girlfriend Sophie. The more sensitive Frank's dissolution borders on tragedy, his cries of help emerging in the form of alcohol consumption and uncontrolled sexual exhibitions. 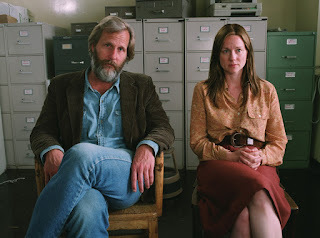 The four lead cast members are all excellent, but Jeff Daniels deserves the most credit. His take on Bernard as a failed husband, failed father and failed author who still thinks he is somehow superior to everyone else is a classic example of unchecked egotism. Baumbach struggles to elegantly land his film, which ends with partial resolutions but enough abruptness to suggest that money, time or ideas ran out. But The Squid And The Whale is nevertheless an impressive peek at the often overlooked carnage caused by broken domesticity.